There's currently six blokes downstairs, hammering, sawing, fiddling and generally working very hard! 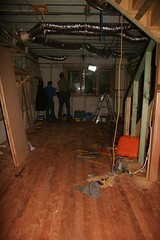 The downstairs 'grotto', as Phil is now calling it, is progressing very nicely. The wooden floor is now in, the sparkies are putting in all the electricals, plumber comes tomorrow to start the bathroom, and gosh, isn't it all exciting! First frost of the cold season!